Looking for a fun, musical activity for your little one over the Easter holidays? 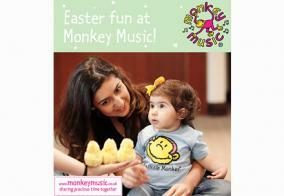 Monkey Music Easter Holiday Workshops will be running at various locations across the UK and are open to everyone from 3 months to 4+ years whether you're a regular Monkey Music customer or not! Click here http://bit.ly/MMEasterFun to find your nearest workshop and to book your place. We look forward to seeing you!